Don’t ask me why, but yesterday I got a craving for New Mexican Red Chile Sauce. Mind you, this is NOT the same thing as those little cans of Enchilada Sauce you see in the stores. Not even close. 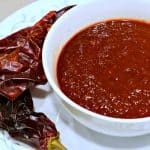 Red Chile Sauce is made from New Mexican Red Chiles, and it’s earthy, pungent flavor is so unique – it’s really hard to explain to people who have never visited the Southwest. Other than it’s AMAZINGLY good! I’m serious, in New Mexico? It’s like ketchup. It goes on EVERYTHING. You may be thinking Mexican foods – Tacos, Burritos, Enchiladas……well sure…. but…. What about a plain baked potato? Yummy! A bowl of rice or beans? You bet! Black Bean Veggie Burgers? Oh my gosh…stop! You get the picture. Anything! And the best part? It’s 100% fat-free, low in calories, and full of vitamins and nutrients. Super easy and with minimal mess. One cookie sheet for baking. One pasta pot for boiling. And a blender. Step 1: First step, we’re going to need some Chiles. Look in your grocery store’s Mexican food section, where they sell the Pace picante sauce, Taco shells, etc. They should have a little section of dried spices, usually with corn husks for tamales, etc. 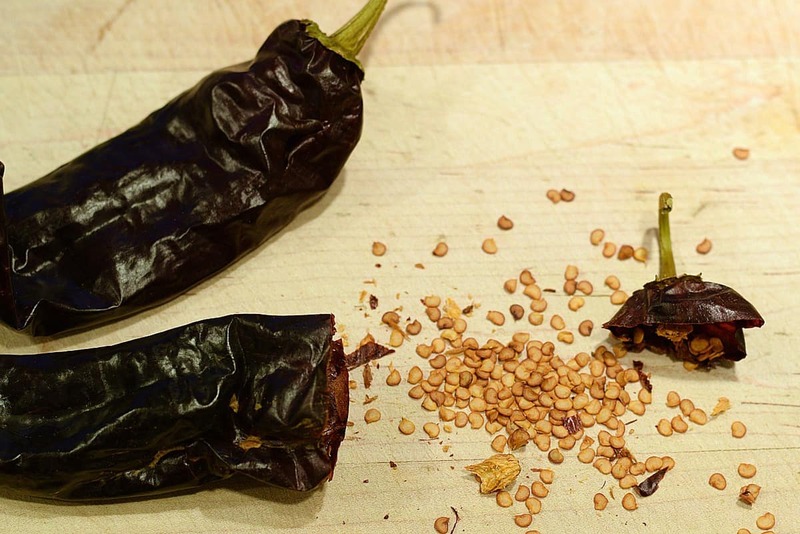 Look for a big bag of dried New Mexican Red Chile Pods. I know they’re out there as my Walmart here in Portland carries them. We’re going to need about 20 pods for this recipe so make sure you get the right size bag. And we want the pods – not the powder. You may see bags labeled California Chile Pods. I personally have never tried them and only use New Mexican Chiles. Although both states grow chiles – the growing conditions around Hatch, NM are such that the chile has a very distinct flavor. Kind of like buying a store bough tomato compared to one you just picked off a vine. Sorry California, no offense intended. Pick out about 20 of the best looking pods and arrange them on a cookie sheet. We’re going to roast them in a 250 degree oven for about 20 minutes. Just enough to bring out the flavor – but not burn them. Once they’re done roasting, let them cool to touch and begin to de-stem and de-seed the chiles. I use kitchen shears to snip off the stem end and dump out all the seeds. Note: The seeds and membranes inside chile pods (even dried) contain an oil called Capsicum. It is very irritating to some, especially if you rub your eyes, nose, or other sensitive body parts. Wear gloves if you need to – just be careful. Once all your chiles are cleaned, add them to a large pasta pot with enough cold water to cover them and bring to a boil. Once it comes to a simmer, cover and turn off the heat to steam for about 10 minutes. Use tongs (or a slotted spoon) to remove the softened chiles and place them in your blender, saving the water as we’ll need about 2 cups to use for blending. Now some people don’t like using the chile water as it can be a bit bitter. Easy – just use fresh water instead. To your blender full of chiles, add 2 cups of water (use the chile water or fresh), an 8oz can of Tomato Sauce, and 1/2 tsp each of garlic powder, onion powder, Mexican oregano, cumin, and ¼ tsp salt. Also, add 2-3 cloves of fresh garlic and about ¼ of a white onion. 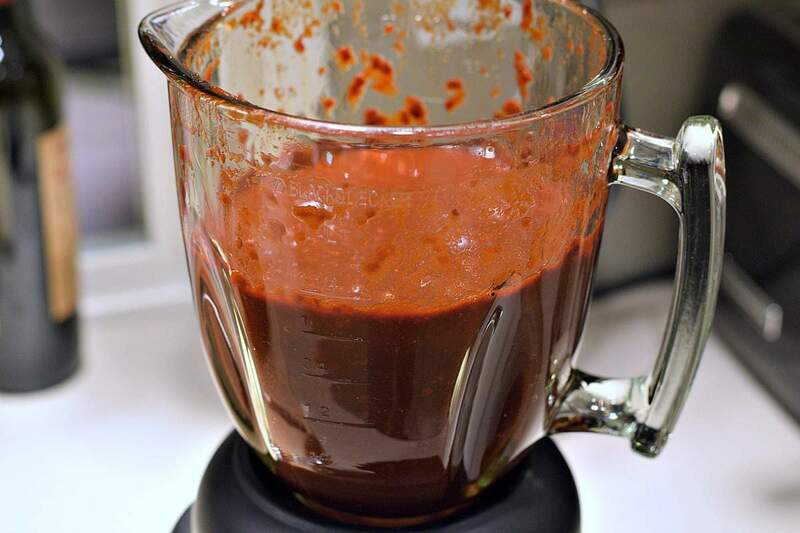 Now at this point, some people like to strain their finished Red Chile Sauce through a sieve to make it even smoother. This removes any small pieces of chile skin or seeds. I don’t. It takes a lot more time, it’s very messy, and I personally like it a little chunky. Besides, it tastes so good at this point I can’t bear to throw any of it away! Your choice but it does not strain easily. You’ll have to use a rubber spatula and really work the sauce through the sieve. Call me lazy, but I like it just as it is. Potatoes, rice, beans, tacos, enchiladas, burritos, tofu scrambles, toast, biscuits, corn, vegetables. Think of it like gravy – try it on everything! New Mexico is truly an enchanting place. I lived in Albuquerque for almost 10 years and of all the things I miss…… the food is probably on top of the list, namely the Chiles. Now you can have a little piece of New Mexico wherever you happen to live. 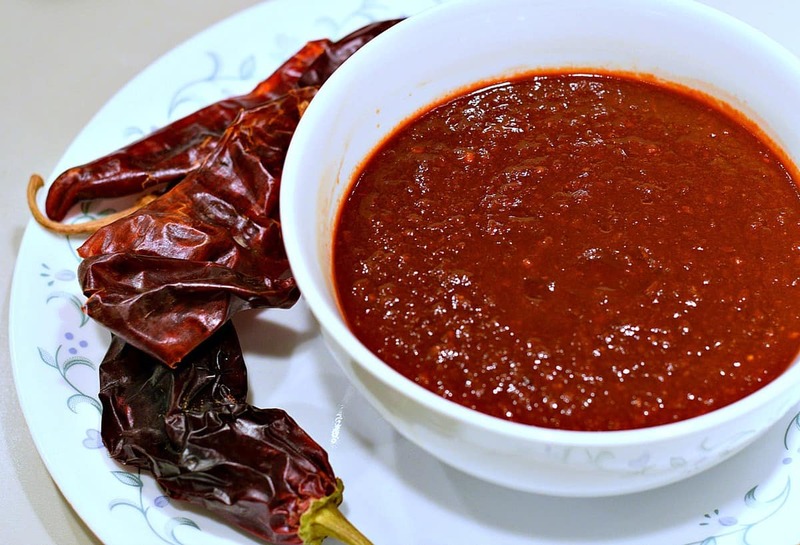 Forget those little cans of store bought enchilada sauce, this homemade New Mexican Red Chile Sauce is the perfect condiment for any of your Mexican meals. Hi Chuck, Do you know how long this would keep in the fridge, and can it be frozen? Fat Free is not good for you!!! Carbs is what will get to you, all known folk-diseases (Conditions) are because of Carbs, and Beans are Legumes = Just draining your body from Minerals and Vitamins! Rice is nothing but Simple Carbs and it is a Grain = Not Food!!! Dude – do a complete 180 and go find yourself a low-carb website. This is NOT one of them. We are HIGH CARB – LOW FAT here, and pretty darn healthy because of it. I suppose if white rice is not a food then billions of Asians have been doing the whole “eating” thing wrong for centuries……. Wrong answer but thanks for playing. Thanks for the vegan friendly recipes, and for sticking with the New Mexican chiles. I love this state, and would love to see the chile farmers here continue to be able to make a good living. Great response! I’m all about whole food plant-based lifestyle and I was able to reverse a chronic disease because of this change from the Standard American Diet. Also, I recently moved to another state. Previously, I had lived in New Mexico for nearly forty years. I so miss New Mexican food!! Thank you for your Vegan recipes, especially the Easy New Mexican Red Chile Sauce! Thank you a million times over! You need to go read the starch solution by John McDougall MD. carbs do not make you fat. Being a native New Mexican, I can guarantee you this is NOT an authentic NM chile recipe. One easy clue–it has TOMATO sauce in it. You should change your title. 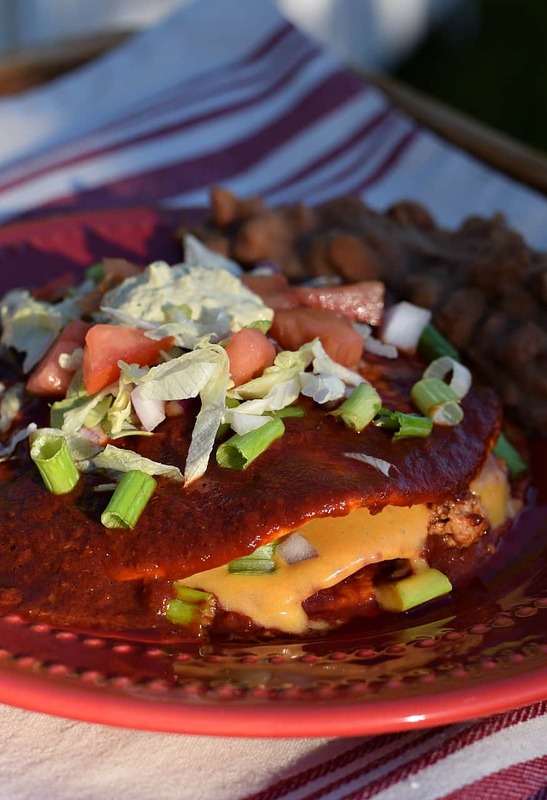 I don’t care if you claim to have lived in NM for ten yrs, that is NOT a native recipe. Agreed! Tomato sauce does not go in New Mexico red Chile! That’s totally sacrelige! Not authentic at all! He never said it was authentic. He said it was EASY! And he did not say it was a native recipe, just that he lived in NM for awhile and this was how HE made red chile sauce. I have made it both ways…. with and without tomato sauce. Personally I like this recipe best. To each his own taste! Stop being so hateful and go find a life. You are sooooo right on with this point! Chiles and Tomatoes don’t mix! If your in ABQ ya gotta get some red chile from Helens! Little place has the Best! I like Rancho De Chamiyo if you dine in however do not buy theirs canned. They add vinegar for preserving and it’s ruined. Being that I am from NM born and raised in the Hatch valley! I wanted to say thank you for a great recipe. No it is not normal to add tomato sauce to a enchilada sauce. But it does add some good flavor and thickens the sauce which is were most have issues. Using the fire roasted tomatoes and blending them with the chile adds another layer of goodness also! I agree, my grandmother didn’t use tomates in her chili sauce either, but as a vegan from the Southwest, now living in Central Minnesota, I have difficulty getting New Mexico Chile’s here. I found that I can order Hatch Chile powfer along with whole and dried on line. I generally order several pounds of the Hatch Red Chile Powder a couple times a year as I love the stuff. I think the powder is a bit sharp and I also add a little tomato sauce as I found it helps smooth the chili sharpness. I don’t add much, just enough to meld the flavors as I don’t want to taste the tomato flavor either. A good recipe and I look at all recipes as a guide to get me in the ballpark… Close enough, but where I can still tweak for my taste. Potatoes, Tofu, Beans, that is what giving you diseases and Obesity! Fat is something your body needs, not Carbs, especially not fake Carbs and Antinutrients like Beans (Legumes) Simply drains your body for Minerals and Vitamins, and keep your body from properly absorbing new ones, welcome to a world of feeling sick! Disease is caused by the bioaccumulation of toxins which are primarily found in fat. Compare Dr. McDougall with Dr. Atkins and . tell me that carbs are what cause obesity. Stick to the complex carbs, Chuck, so you can keep giving us these great recipes for many years to come..
Made it with 15 NM and 5 pasilla today for our Christmas tamales so it could be like the types we’re used to eating in PHX. Wow! It’s so good. Can you tell me how to make that please? This sauce is so good!! I will never buy salsa or enchilada sauce again. Esay to make and absolutely excellent on beans, and totilla chips. I used 13 California and 7 New Mexico pods. Will reverse those numbers next time. I did not strain and used the boiling liquid instead of water. SO GOOD. A basic sauce for beans etc etc. My regret is I discovered this sauce at 65 yoa. Always saw the died pods in the store and wondered how they were used. DUH! I will eat this sauce/recipe every day. This Angelino finds the sauce delicious and easy. Like John above, my only regret is I haven’t learned to make this earlier in my life. Hahahah that part where you wrote “Black Bean Veggie Burgers? Oh my gosh…stop!” It will forever crack me up everytime i think of it! Your too funny! I dont have a working oven anymore so i had to pan roast the peppers- no more then 20 seconds per side on high heat otherwise you get that bitter flavor. And simmered the sauce in the end but other then that followed the recipe exact n it came out mmmm mmm delicious! Thank you! A couple of years ago I adopted a vegetarian diet, mostly vegan, but I do still eat eggs. Anyway, I tried mixing this chili sauce into some Lightlife Gimme Lean veggie sausage. The result was delicious. It’s very much like chorizo. I guess it’s not too surprising because chorizo has some of the same ingredients as this chili sauce, notably cumin and oregano. For vegetarians, this work great with scrambled eggs. Wow! Wbaf is a New Mexican Sauce to you…has been a traditional maiin ingrediant for our family of 4 generations or more for the most important Christmas food,Tamales! And this is family born and raised in Texas! I like the sauce with qusedias, or .pork chops n flour torrtias! Are the New Mexico chilies hot? I love hot foods, but my husband does not. This is good but not very hot at all. In fact I might add some heat. Everyone has their own unique style of cooking and their own spices and secrets for their own recipes . Be kind Chuck was kind enough to share his. Awesome recipe. Thanks. I have no complaints as I think that this sauce is great. I will definitely make again. A newby question: Is Mexican Oregano different from the oregano i buy in the spice section of the grocery? Mexican Oregano’s taste is a bit more citrusy; with subtle hints of lime that really enhance the flavor of chiles and paprikas. This recipe looks really tasty and seems to be a nice staple to have your arsenal of sauces!! My question is, how HOT is this, spicy wise?? I can handle a little heat. Usually tell restaurants I need it mild…..is this sauce for me?? I would say it really depends on where you live. Outside of New Mexico – bagged Red Chile Pods in the stores are slightly warmer than a Bell Pepper – but not as much as a Poblano or Jalapeno. My wife does not like spicy either and she loves the stuff. Chuck, your heat index is def higher than mine!!! I’ve been gradually raising the heat my tongue will tolerate as my great Latino neighbors here in AZ share different dishes with me – and I’m definitely more heat tolerant than I was, being raised in the cool Oregon coast climate. So I was excited to see this simple recipe. This was my cooking project for today, and I was eager to taste the result – yowza. (BIG EYES!!) I loved the flavor but just couldn’t do the heat, dang it. I got the same brand peppers you used, but I know they vary, and I think a few really HOT ones sneaked into that bag! I gave the quart of lovely sauce to my neighbor, she was thrilled – and laughed with me, as she has been one of my mentors in learning to cook Mexican foods! She suggested that I try it mixed with a lot more tomato sauce to cut the heat to my level, which I plan to do. As soon as I stop sucking ice-cubes….lol! Anyway, thank you for the good recipe, it was a fun learning experience for me, and a great little gift to my good neighbor! 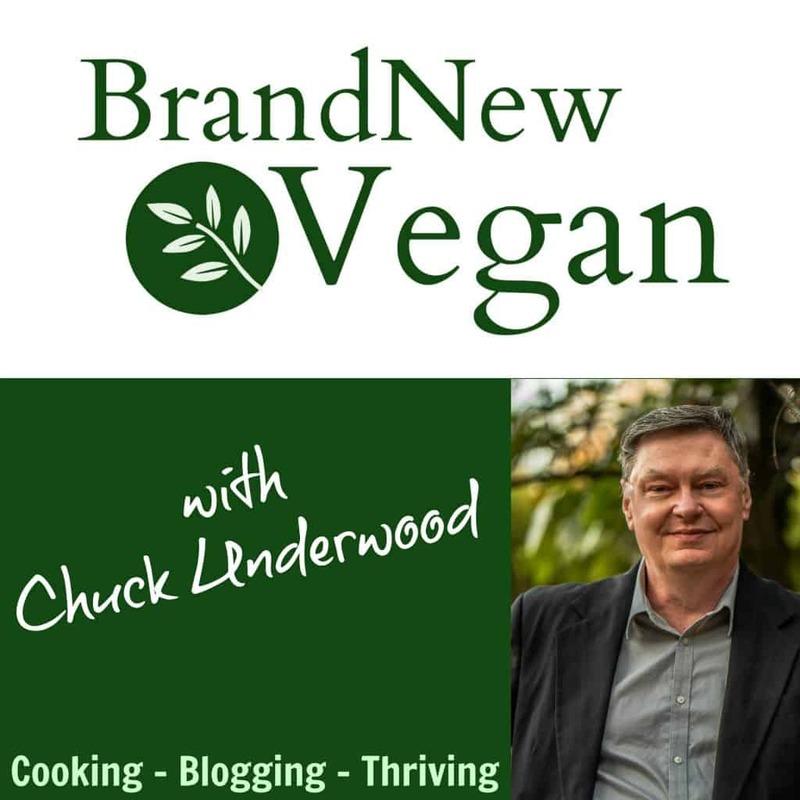 I really appreciate the time and effort you put into Brand New Vegan, and have thoroughly enjoyed your recipes. Thanks for enriching life for all the rest of us “brand new vegans”!!! This is good but very mild. In fact I might add some heat. I may never use ketchup again. Thanks, Chuck. Great recipe. I’m Native American, from Arizona, so I gave it my usual traditional spin. No tomato sauce and no onion. Just the chiles, Mexican oregano, garlic, a little salt, and a very small amount of pure maple syrup. The syrup tames the bitterness of the chile cooking water. Nice tip with the syrup! Thanks. Chuck, where in New Mexico did you first try this Chile sauce? I would love to try this recipe, as made by someone else. I fear I may not like it as I grew up with only one way to make it with a few ingredients that are different from your’s. I always think of adding additional seasoning to my red chile to give it “umph”, but I am a “letter of the law kind” of person when cooking/making anything that has been passed down from many generations in my family. I am learning to be more of a “spirit of the law” type. It is a work in progress. Canned tomato sauce? Is that vegan? Why not real tomatoes? This makes a lot of sauce. Can it be frozen? How long would it last in the fridge? Yes to frozen. I wouldn’t keep it in the fridge more than 5 days.